Test Socket suits devices from 28 to 40 mm². Designed for manual testing of devices with pitches down to 0.40 mm, CSP test socket provides minimal signal loss for high bandwidth capability via signal path of 1.95 mm. Solderless, pressure-mount compression spring probes allow device to be easily mounted to and removed from test board. Measuring 77.47 x 63.50 x 32.28 mm, sockets have contact forces of 16 g per contact for 0.40 mm pitch and 25 g per contact for 0.50 mm pitches and larger. FRENCHTOWN, N.J., October 2006 -- Aries Electronics, an international manufacturer of standard, programmed and custom interconnection products, has introduced a new CSP test socket for devices from 28 mm² to 40 mm². The new socket is ideal for manual testing of devices with pitches down to 0.40 mm, such as CSP, MicroBGA, DSP, LGA, SRAM, DRAM, and Flash devices. The new socket provides minimal signal loss for higher bandwidth capability via a signal path of only .077" (1.95 mm). The socket's overall size of 3.050" (77.47 mm) x 2.500" (63.50 mm) x 1.271" (32.28 mm) provides the maximum allowable space for board components and connectors. Solderless, pressure-mount compression spring probes allow the socket to be easily mounted to and removed from the test board. These gold-over-nickel compression spring probe screws leave very small witness marks on the bottom of the device solder balls, and are accurately located by two molded plastic alignment pins and secured with four stainless steel screws. The 4-point spring probe crown on the new socket ensures "scrub" on solder ball oxides for reliable contact mating, and the pointed probe works with LGAs, MLFs and other device types. 30 µ" min. (0.75 µm) gold per Mil-G-45204 over 30 µ" min. (0.75 µm) nickel per QQ-N-290. 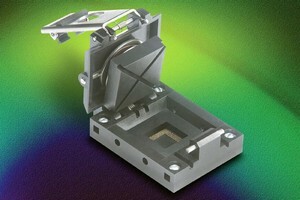 The socket's molded components are UL94V-0 PEEK and/or Ultem. All hardware is stainless steel. Contact forces of the new sockets are 16g per contact for 0.40mm pitch and 25g per contact for 0.50mm pitches and larger. Operating temperature is -55°C to +150°C (-67°F to +302°F). Estimated contact life is over 500,000 cycles. Pricing for a 100-pin socket starts at $170.00. Delivery is four to six weeks ARO. Headquartered in Frenchtown, NJ, Aries Electronics, Inc., manufactures an extremely broad range of custom and standard interconnection and packaging products for electronics. Industry leading products include Zero Insertion Force (ZIF) test sockets for DIP, PGA, PLCC and SOIC devices; the Correct-A-Chip(TM) product line of "intelligent connectors"; adapters and connectors; several patented concepts for BGA (ball grid array) and LGA (land grid array) sockets; and an extensive array of high frequency test and burn in sockets. The company also specializes in meeting custom requirements for its customers.